A DISTRAUGHT resident from Woking called the News & Mail in tears on Monday morning when she discovered no progress had been made on her home in Albert Drive that had been severely damaged by the flash floods last week. 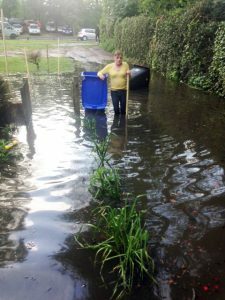 Catherine McColl, who is disabled and has lived on the ground floor at the council-owned property since 2003, was at the end of her tether when the rising tides of the Wednesday deluge took over her home – both inside and out. With faeces and dead rats floating around in the floodwaters, fears of contamination could only exacerbate the risk to her already vulnerable physical and mental condition, and the health of those around her. The 46-year-old, along with other Albert Drive council tenants, were given temporary accommodation at the nearby Travel Lodge for a week, while Woking Borough Council tried to sort out the prob-lems with Thames Water, who they said is responsible. By Friday, frustrated and upset by the lack of action, Catherine, who is seen by three carers each week, called the News & Mail to complain. When she discovered on Monday that still nothing had been done – and that she could see no sign of her home being habitable any time soon – she called her local paper again: “It’s one of the four ‘forgotten homes’ in Albert Drive,” she sobbed. Valiantly, though, a community minded business based nearby at Woking Business Park rallied round and came to the rescue. Wandsworth Electrical Managing Director Adam Sherry told the News & Mail: “We were lucky, but when we left work we could see people living nearby had been badly flooded, and it really stank. Micky Royal, another council resident whose home was badly affected by sewage flooding, add-ed: “I still can’t believe we have been left like this since Wednesday [11 May], but Wandsworth have been absolutely brilliant. They’ve even offered to give us new cookers – they’ve been great! Catherine also said these issues have been reported to the council 37 times in the past 12 years, but that this was the first time the sewage had gone inside their homes. Councillor Colin Kemp confirmed that there has been sewage overflow problems at numbers 1, 3, 5 and 7 Albert Drive for as long as 15 or 20 years – and that Thames Water has just been coming up with short-term fixes. He said: “They have just been scratching the surface and, for the last three months, council officers and I have been trying to get them to deal with it once and for all. After volunteers of Wandsworth had spent hours helping out on Monday, three Thames Water staff eventually showed up. When asked about the problem long term, Mr Trenchard replied: “We have to inspect and monitor the situation and the flood sewer network. We may need to work with the borough and county councils to find a bigger solution.